With the holiday season here, it's time for eggnog! I've always looked forward to this beverage since I was a child (of course I had the non-alcoholic version back then) and I still feel the need to have it in the house every year. I wondered about the history of this holiday tradition, and thought I'd share it with you. The origins and the ingredients used to make the original eggnog drink are debated. 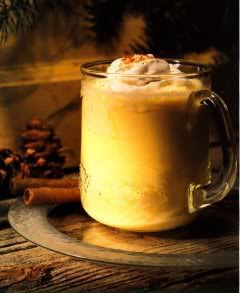 Eggnog may have originated in East Anglia, England; or it may have simply developed from posset, a medieval European beverage made with hot milk. The "nog" part of its name may stem from the word "noggin", a Middle English term used to describe a small, carved wooden mug used to serve alcohol. However, the British drink was also called Egg Flip. Another story is that the term derived from "egg and grog", a common Colonial term used for the drink made with rum. Eventually that term was shortened to "egg'n'grog", then "eggnog". The ingredients for the drink were expensive in England, so there it was popular mainly among the aristocracy. "You have to remember, the average Londoner rarely saw a glass of milk," says author and historian James Humes (To Humes It May Concern, July 1997). "There was no refrigeration, and the farms belonged to the big estates. Those who could get milk and eggs to make eggnog mixed it with brandy or Madeira or even sherry." The drink crossed the Atlantic to the English colonies during the 18th century. Since brandy and wine were heavily taxed, rum from the Triangular Trade with the Caribbean was a cost-effective substitute. The inexpensive liquor, coupled with plentiful farm and dairy products, helped the drink become very popular in America. When the supply of rum to the newly-founded United States was reduced as a consequence of the American Revolutionary War, Americans turned to domestic whiskey, and eventually bourbon in particular, as a substitute. So that's your history lesson for today. So take part in the tradition and drink some eggnog tonight ... whiskey, bourbon or rum will do!